Airtel and MTN have been good this year with a lot of amazing offers. Airtel recently gave 4gb data for just 200naira( which has been blocked), now they are giving triple data. I think this will last longer than the 4gb data plan because this triple data offer is to attract new customers. A new Airtel sim card or a sim card Less than 3 Months Old. HOW TO GET AIRTEL TRIPLE DATA OFFER. Send GET to 141 as text message. Then send MIFI to 141. Dear Customer, Congratulations! 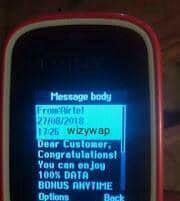 You can enjoy 100% DATA BONUS ANYTIME EVERYDAY FOR THE NEXT 3 MONTHS. If you don't receive the message insert your sim on a phone you haven't used it on before and try it again. 🔥Buy any of the following data bundles. 750mb( triple data = 2.2gb) for 500naira -> dial *141*500# (14 days) 750mb x3 = 2.2 gigabytes +bonus. 1.5 (triple data = 4.5gb) for 1000 naira -> dial *141*1000# (30 days) 1.5gb x3 = 4.5 gigabytes + bonus. 3.5gb (triple data = 10.5gb) for 2000 naira -> dial *141*2000# (30 days) = 3.5gb x3 = 10.5 gigabytes + bonus.